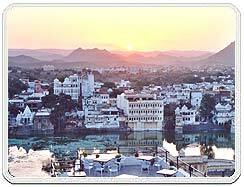 Maharana Udai Singh II founded Udaipur in 1568 after his citadel Chittorgarh was sacked by Mughal Emperor Akbar. The legend says that Udai Singh was guided by a holy man meditating on the hill near Pichola Lake to establish his capital on this very spot. Surrounded by Aravali Ranges, forests and lakes this place was less vulnerable than Chittorgarh. Maharana Udai Singh died in 1572 and was succeeded by Maharana Pratap who valiantly defended Udaipur from subsequent Mughal attacks. Maharana Pratap is the most revered Rajput icon and gallantly fought the Mughal at the Haldighati in 1576. 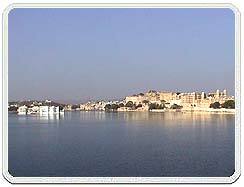 Mewar continuously defied foreign invaders and has a history of bloody battles until the British intervention in the nineteenth when a treaty was signed to protect Udaipur. Upon independence Udaipur merged in the union of India. This majestic white royal building towers itself on a hill and is surrounded by crenellated walls. The palace stands along the shores of Pichola. This former summer residence of the royal family has now been converted into a fabulous hotel GARDENS. 22 kms from the city is a temple complex of 108 temples enclosed by high walls. Built in 1734 AD, the temples are dedicated to the royal deity Ekling ji. The complex has been chiselled out of sandstone and marble. It has an ornate 'mandap' or pillared hall, the canopy of a huge pyramidical roof composed of hundreds of knots. Known as Dwarkadhish, this temple is an important Vaishnava temple and ranks very high among the temples of the Vallabhacharya. 65 kms from the city. 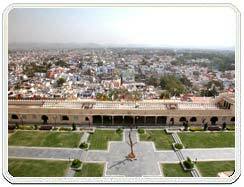 (98 Kms) Famous for the beautiful Jain temples. The tenth century Ambika Mata Temple is well preserved in all its splendour. This ancient place in Mewar is famous for their intricate carvings of the graceful 'apsaras'. 23 kms from the city. 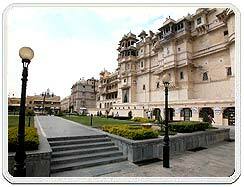 This place, 40 kms from Udaipur, has immense historical importance. It was at Haldighati in 1576 AD that armies of Maharana Pratap and Mughal Emperor Akbar clashed. A 'chhatri' with delicate white marble columns is dedicated to the indomitable hero and his loyal charger. 48 kms from the city, this artificial lake was built in 17th century by Maharana Jai Singh. The marble 'Chhatris' along the embankment add grace to this second largest lake in Asia. On either sides of the lake were built the palaces for the favourite queens of the King. People of the Bhil tribe still inhabit the islands in Jaisamand lake. This is dam built by Maharana Rai Singh in 1660. We arrange accommodations in comfortable surroundings. 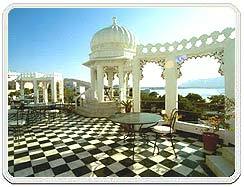 Udaipur has numerous accommodation facilities in several categories ranging between luxury and budget. One can pick from luxury, deluxe, star and budget category hotels. All the hotels provide good length of facilities and services, according to one's interest and expense.